“Just for once, I’d like to come in to the office with a clean batch payment report,” Mohit thinks to himself as his eyes meander down the list of payments and direct debits that could not be processed in last night’s payment run. “Is there really no way to automate updating vendor and customer bank details in this day and age?” Payments processing, he scribbles on his notepad, must be overhauled in the coming weeks. Mohit is newly appointed controller at an Indian fast moving consumer goods company. * His story, fictitious as it may be for the purposes of this article, sums up the experience of countless corporate finance professionals in Asia and is based on findings from the 2018 Treasury Review, conducted earlier this year by Asset Benchmark Research in association with DBS. Formerly the head of the company’s purchase-to-pay function, Mohit is acutely aware of how widespread manual processes prevent the finance function from providing the added value support role he envisages for his colleagues. His previous boss, now retired, never appreciated his calls for automation. 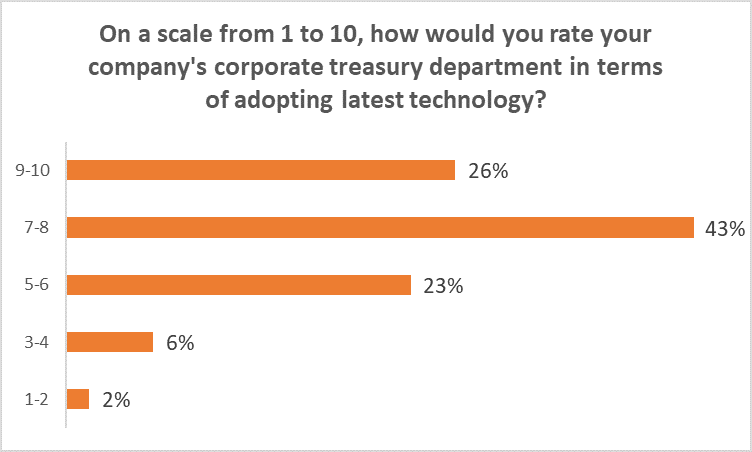 Data collected from the Treasury Review reveals a reality gap among corporates, regardless of size. 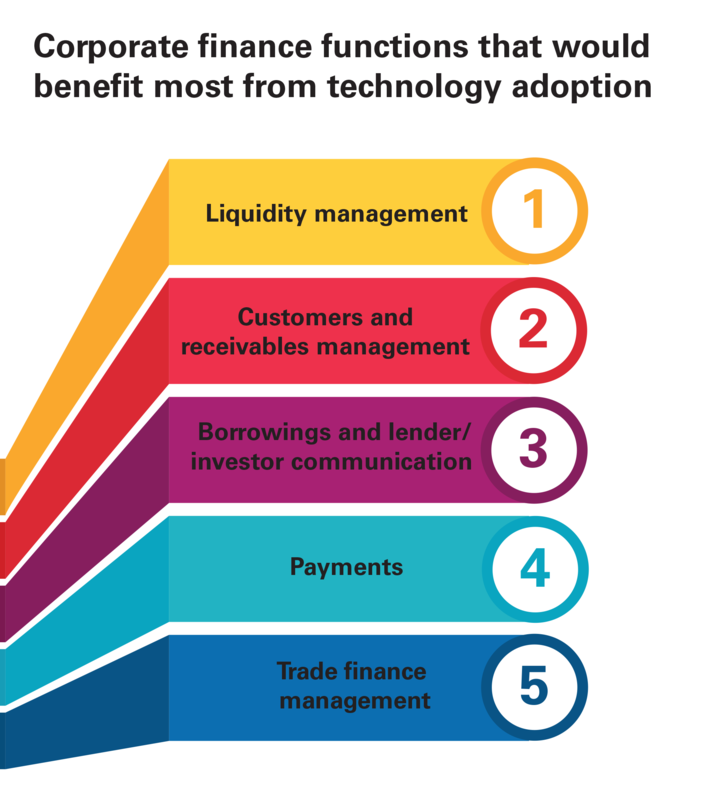 One in four companies rate their finance function as ‘9’ or above on a scale to 10 in terms of adopting latest technology. Only 31% mark themselves with ‘6’ or below. 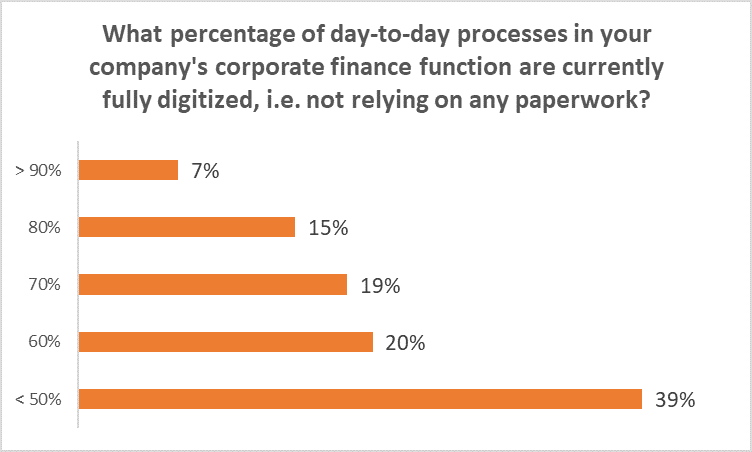 Yet, the majority of respondents also admit that less than 50% of their day-to-day finance processes is fully digitalized. Even bread and butter tasks from bank reconciliations to duplicate payment checks involve sheets of paper (or excel workbooks). Anything above and beyond, such as monthly reversals and postings of accruals or the application of new accounting standards, is bound to multi-step manual processes, signed off in line with a long list of delegations of authority (ideally on paper for the auditors). Mohit recalls countless discussions with his then-superior, asking for the opportunity to explore new technologies with banking partners and fintech providers. “I have a thousand users on our banking platform and to control those users is a huge challenge. At the moment we are managing 10-11 banking platforms. All of these platforms are different in nature. There is a huge risk there,” he argued. While more than 60% of respondents indicate they have centralized bank relations and financial risk management including FX hedging, this percentage drops to fewer than 25% for tasks such as cash flow forecasting, receivables and credit management, surplus cash investment and taxation. These are also the areas that most respondents believe would benefit from greater application of technology. Implementing new automated solutions would therefore first require unification of disparate processes across an organization. No wonder that many companies choose to carry on as previous, citing cybersecurity concerns (12% of respondents) and restrictive board policies (10%). Mohit’s focus on improving payments and collections processes is shared by many respondents in India, where payments are cited as the number one area that would benefit from greater application of technology. Among Chinese corporates, on the other hand, liquidity management ranks first while only 4% feel payments require better technology. For Taiwanese companies, meanwhile, customer and receivable management ranks first. In part, this is a reflection of the economy. According to FCI, Taiwan is the third largest factoring market in Asia after China and Japan with 5% growth in 2017. Automation is sought primarily in due diligence and small client risk assessment, to facilitate faster approvals and greater access to the factoring market. Mohit’s vision for the finance and treasury function he now leads is clear. Instead of mechanically working from month end to month end, burdened by budget constraints and seen as an unavoidable operating expense, his team should be in a position to add value and provide operational insights. That vision is shared by peers across the region. 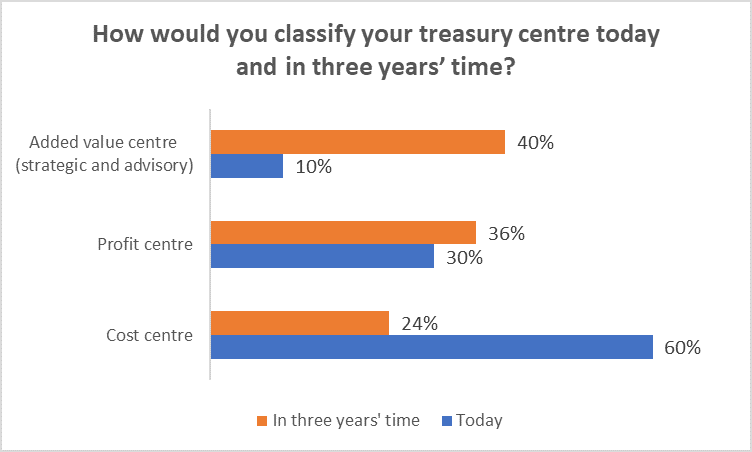 60% of respondents view their finance and treasury functions as a cost centre today but 40% want it to be an added value support function in three years’ time. Among large companies (with annual turnover >$1bn), only 13% feel their departments provide advisory services to the rest of the business – but more than half (52%) hope it can be by 2021. In practice, this will require greater autonomy given to these departments in finding new partners with innovative solutions to complex problems. One in four corporates currently work with just one major bank for cash and liquidity management needs for their operations in Asia. Among SMEs, the percentage is a startling 34%. Counterparty risk considerations aside, widening that pool of service providers could open up fresh perspectives for many companies. Catch up on part one of our Digitalization of Asia’s Treasury Operations series produced in association with DBS here and stay tuned for upcoming articles to learn how corporates are beginning to deploy new technologies. Conducted since 2013, Asset Benchmark Research surveys corporates across Asia on an annual basis to understand the challenges corporate treasurers and CFOs face and the solutions they consider best suited to navigate financial markets. In 2018, a total of 1,141 corporate finance representatives participated in the survey, led by decision makers in Greater China, India and Singapore. Based on annual turnover, 50% of respondents are small and medium sized enterprises, 25% are mid-caps and 25% large corporations (>US$1bn turnover per annum). Nearly 70% of respondents are C-level executives (finance directors, CFOs or above) or have managerial roles in the finance and treasury departments, while the remaining work in positions such as staff accountants. *Names of characters and entities are fictitious.